Accent your living and entertaining space with the Vincent Cocktail Tables. Woodwork is crafted with a warm brown finish that offers a homey, cozy look and feel. Including one cocktail table and two end tables, it has everything you need to furnish your living room. 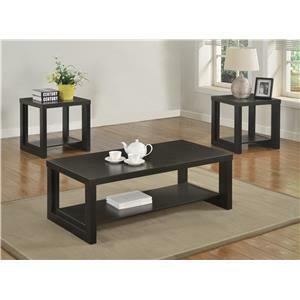 Coffee Table: 48" x 24" x 17"
End Table: 24" x 22" x 21"
The Vincent 3-Pack Cocktail Set by Crown Mark at Casa Leaders Inc. in the Wilmington, Long Beach, Torrance, Lakewood, Los Angeles area. Product availability may vary. Contact us for the most current availability on this product.